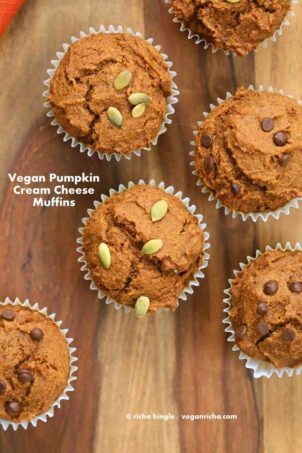 Vegan Pumpkin Cream Cheese Muffins. Easy One Bowl Pumpkin Spice muffins with vegan cream cheese filled in them. Warm spices, full of pumpkin, all whole grain Spelt flour. Garnish with pumpkin seeds or chocolate chips. Make with or without cream cheese. Vegan Breakfast Recipe Makes 12 regular size muffins. 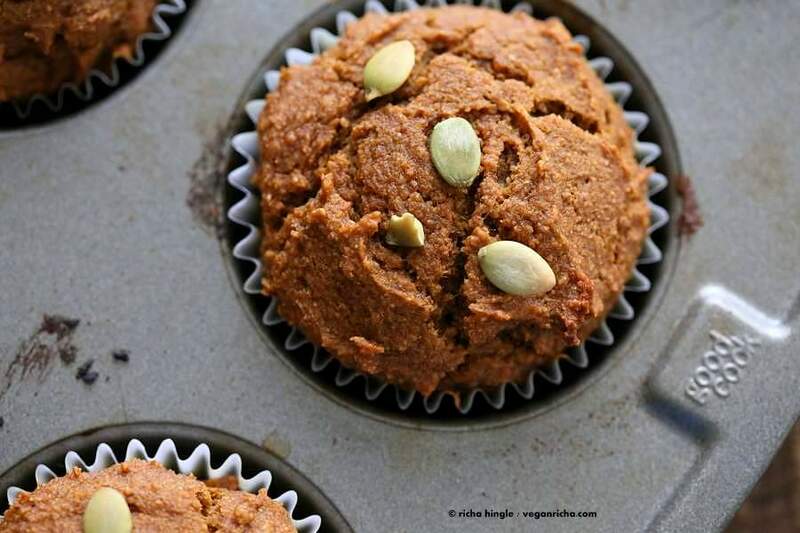 Pumpkin season = warm spices, loads of pumpkin and moist deep colored muffins! 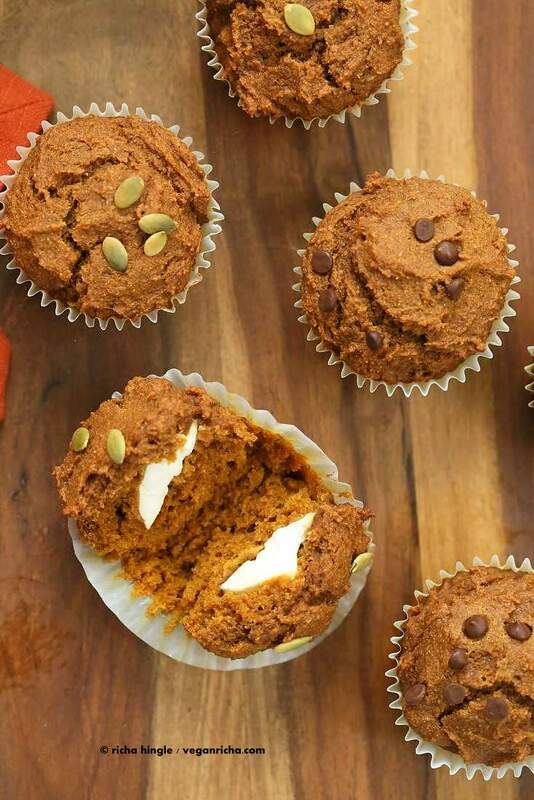 Make these easy Spiced Pumpkin muffins. Add a dollop of vegan cream cheese in the middle or not. Reading for the day. This article on The Guardian about how Industrialized agriculture is the ethical crime in history. Excerpt- “The world contains 40,000 lions but, 500,000 elephants, by way of contrast, there are around 1 Billion domesticated pigs; and 1.5 Billion domesticated cows; and 20 Billion chickens. Make the pumpkin batter. Fill the muffin lines half way. Then add a tsp or so of vegan cream cheese. Add more batter and even it out. Sprinkle pumpkin seeds or chocolate chips. Bake, check with toothpick for doneness. Cool for a few minutes. Serve. Adapted from The PPk’s pumpkin muffins. in a bowl, whisk the dry ingredients until well combined. Add the rest of the wet ingredients and mix well. it will take a minute or 2 for the pumpkin puree to combine well. There should be no streaks of pumpkin. Add a tbsp more non dairy milk if needed. Fill the muffin tins to about half. Add a 1 tsp or more cream cheese in the middle and fill the rest to about 3/4 full. * You can add a Tbsp of sugar plus a pinch of cinnamon to the cream cheese before filling if you want it to be sweet. Even it out. sprinkle pumpkin seeds or chocolate chips or other topping of choice. Bake at 400 degrees F / 200ºc for 15 minutes, reduce temperature to 350 and continue to bake for 6 to 7 minutes. or until a toothpick test comes out clean. Cool for a few minutes before removing from the muffin pan. then cool completely on a cooling rack before storing. Store on the counter if consuming within a few hours. Refrigerate for upto a few days. You can make these with unbleached white flour/ap flour as well. For variation: add cranberries or chocolate chips to the batter. To make without the filling, fill the muffin cups to about 3/4 and bake. Susan, you may need to click on the name of the recipe to get to the ingredient page — that’s what I did. I am not sure why the ingredients are not visible to you. They are right there above the last picture on the post. This sounds awesome! Can regular old white flour be used instead of the spelt flour? Can’t wait to make these! Would I get the same result if I used regular flour instead of spelt and added some chocolate chips to the batter? Can this be made gluten free? Would gum be needed? That article in The Guardian was terrific. Thank you for your recommended readings. I’m so glad I’m seeing more of this perspective in mainstream media. Along those same lines, I just saw “Cowspiracy” on Netflix – I highly recommend it! Now onto happier things – I just bought began cream cheese and this is exactly where I’ll use it! Thank you again. yes indeed. I also linked Cowspiracy on one of the posts last week. Fabulous pieces to get everyone thinking and start more discussions. Just reading this recipe made me smell pumpkin spice! Can’t wait to welcome fall with this recipe! These are delicious! I didn’t have the cream cheese, so I made them without it. Thanks for the great recipe. Awesome!! so glad you loved them! This looks delicious Richa! I love the tofutti brand cream cheese…must try! 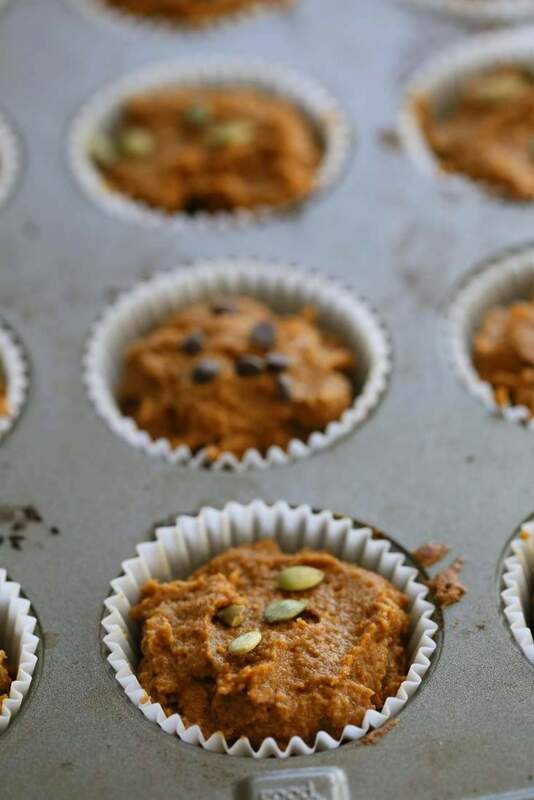 These look delicious and my daughter has been begging me to make pumpkin muffins. I’m still not ready to give up on summer yet, but when I am these will be baking in my oven! 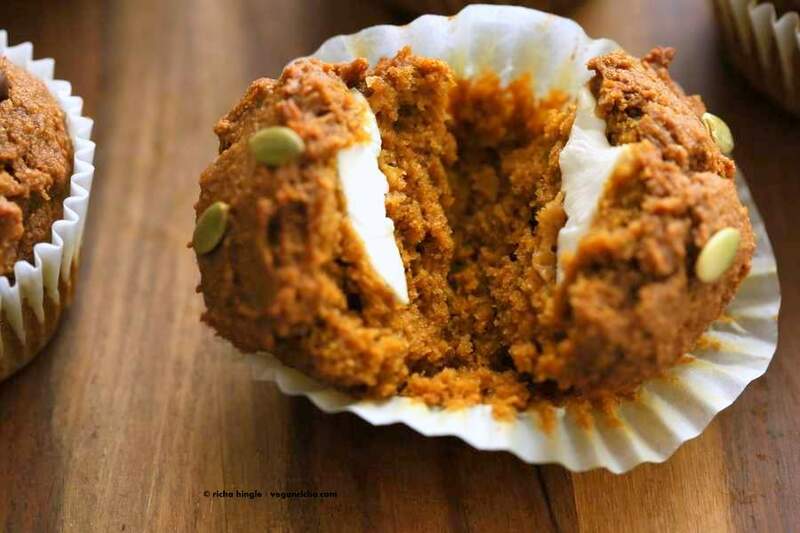 I love the cream cheese center and light bulb – pumpkin seeds on pumpkin muffins, why didn’t I ever think of that! I posted pumpkin oatmeal muffins last Fall, that my son’s pre-k class loved. I’m so excited you can make this with Tofutti! I’m excited for vegan options in fall recipes! Pumpkin cream cheese muffins that are vegan??? Wow, this looks so good! These muffins were outstanding! I made them with quinoa flour instead of regular flour, and with and out 1 1/4 cups mini chocolate chips. I am not vegan so I was ok adding 1 egg and used 2% dairy milk.. I am always looking for good gluten-free recipes, and these were delicious for Fall. Loved them! Thank you! I love what you are doing and your blog!! 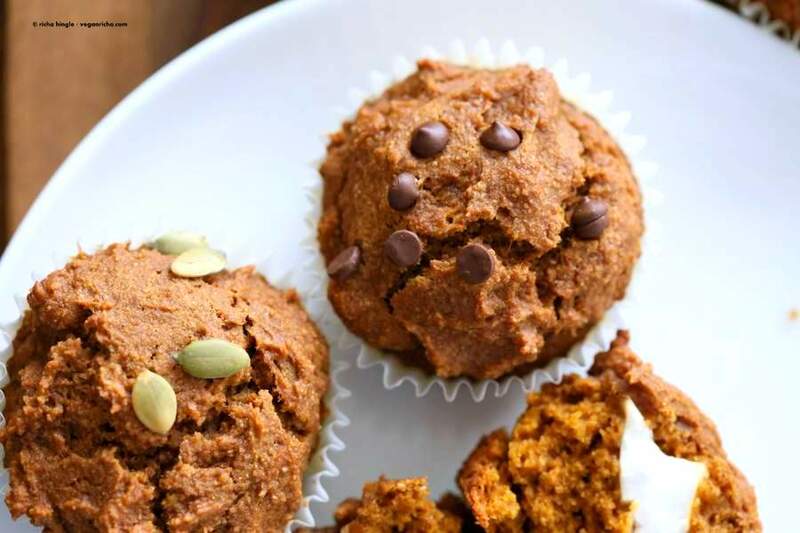 These Pumpkin Muffins look amazing! Can I make this as a pumpkin bread instead of muffins. Yes you can bake it into a loaf. Bake for 45 to 55 minutes depending on your loaf pan. Check with toothpick close to the center to check if its baked. This recipe is yummy. I used regular all-purpose flour and maple syrup instead of molasses (because I didn’t have any). The mistake I made was using Daiya cream cheese. That stuff is crap. I will only buy Tofutti from now on. yay for the muffins. i hope you could scoop daiya out and still enjoy the muffins. some of the cream cheeses, cheeses etc are just weird 🙂 try them before using for baking. Tofutti doesnt work out well in my cream cheese pound cake, but it works well in these muffins since it is not mixed into the batter. I am trying to eat healthier. I have not eaten meat in over 2 yrs. I was eating raw for a while, but the cold weather you want something hot. My question is about the powder sugar, what one do you use ? Is there a vegan powdered sugar or do you make it? I am loving your recipes and can’t wait to make this one.